I have already posted swatches of the items I laid my hands on from Cosmopolite Collection here. 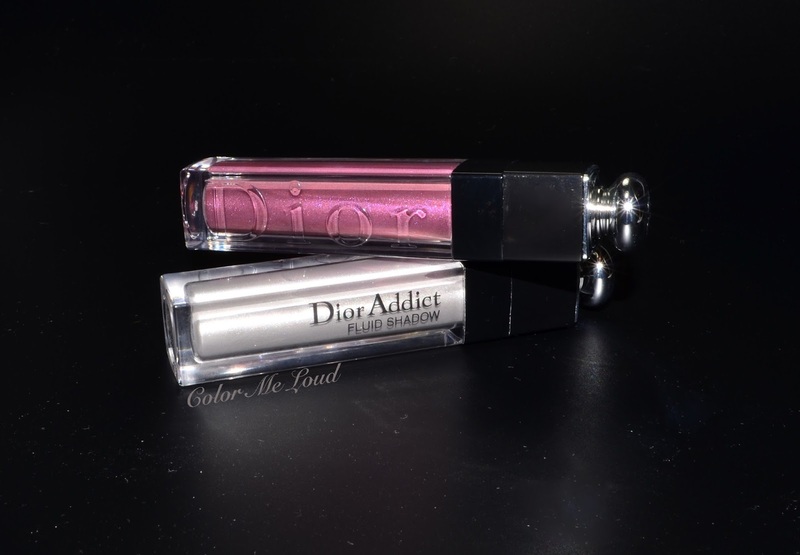 The packaging is the same as Dior Glosses. There is a serious reuse of packaging here, even the brush is the same as the lipgloss. Honestly I am not sold on this type of brush applicator with liquid eye shadow because it leaves brush strokes. For a moment, you thought I am reviewing nail polish huh? 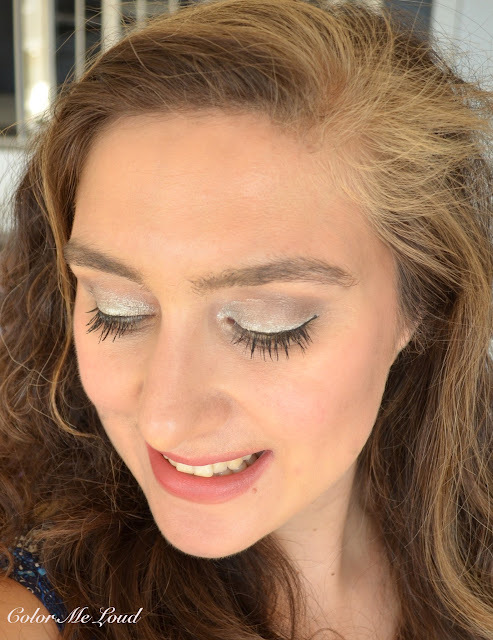 How come brush strokes on an eye shadow you ask? Let me first show you different things I tried to make thin and runny consistency work. The below photo shows the best result I could get when I first applied Dior Addict Fluid Shadow 275 Cosmic. I went for a very thin layer, sheered out with fingers to see actually fingers are a very bad idea with this because it starts looking patchy the moment you touch it. I believe the reason is that it dries so fast and by the time you want to sheer out, some of the parts are already dry so you sheer out some parts while not the others. I then rebuild like crazy. Many many layers, took me half an hour to achieve this look but I really like this color. I wouldn't call it a swipe and go thing though. 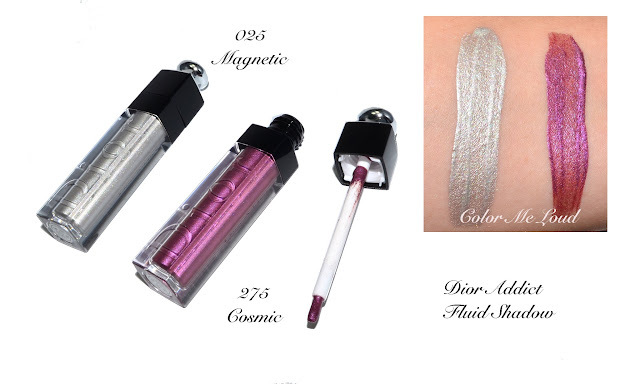 Now Dior Addict Fluid Shadow 025 Magnetic is another story. Although it did swatch better on my arm, on my eyes it was almost impossible to get it right. I ended up with a modern patchy look (!). Maybe this becomes a trend? Now since Dior Addict Fluid Shadow 025 Magnetic didn't made the cut on its own, I thought why not try to combine them. Here is me trying that out. Let me tell you, in real life this one looked much better. It is not all that bad, just not all that easy if you know what I mean. About layering, these can be layered easily but layered or not they are difficult to blend. Here is the full look with both of the shades, 025 Magnetic and 275 Cosmic on eyes, Tom Ford Frantic Pink on cheeks and Spanish Pink on lips. 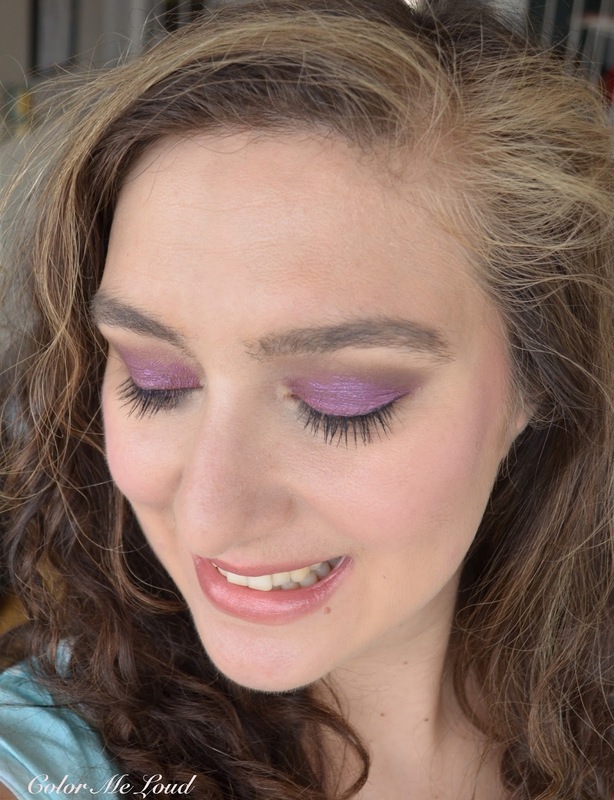 Usually when I wear very metallic shades with some color, I try to keep the rest of the make-up simple and fresh or my colleagues might get shocked. About the formula once more, these are really hard to apply as a wash of color. They dry very fast so end up looking patchy at the moment you touch it. I found that the best application method is to use the brush on the applicator, apply heavily and blend the edges with a fluffy brush. All in all, I like the color of Cosmic as well as what can be achieved with it, but it is too much work for a busy morning. A big thumbs up on the staying power though. It doesn't budge or move over 12-14 hours. Final thoughts: I find the best way to apply the new Dior Addict Fluid Shadows is to use the brush provided and not touch to blend because they become patchy. You can use a fluffy brush and blend the edges. You can also dry to apply them with a fluffier brush if you like sheerer application. Once they are on, they have a very good staying power but I don't have time to make it work in the morning so probably I won't be picking up more of these. 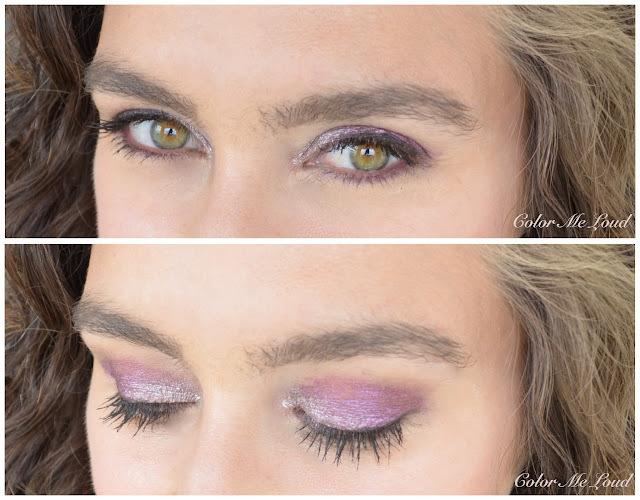 Do you like liquid eye shadows? They seem to be having a moment right now. Hey Sara, thanks for the review! I really do love Cosmic on you. It's a stunning color! The formula sounds tricky to work with, although I've read somewhere that they aren't supposed to be sheered out/blended out. Apparently they are meant to create a color block. It looks great on the model in the promo image, but I'm saying it's definitely not for every day! Sara, you are so optimistic and patient! If I had to layer an eyeshadow for half an hour, I would bring a hammer from the kitchen and smash that thing hard for all my suffer. I don't mind sheer like the Guerlain summer was. Though, sheer and patchy bright metallic color sounds like a real pain. That's disappointing! Who's got time to deal with such a difficult product?! Cosmic is absolutely gorgeous. Not sure I'd have the patience though! They sound like water shadows Chanel had ages ago. Minus the brush. I guess they would perform better in more graphic looks? Maybe? Colors are great, but I'll stick with Giorgio. I really like how cosmic looks on you but this formula sounds a right pain to use so think I will give these a miss. From what I have seen so far I'm not wowed by Dior, Tom Ford or Chanel Fall, I am really looking forward to Suqqu Fall though. It would seem the growing trend is long wearing fluid eyeshadows. I agree with you, the packaging is not the most appropriate for these liquid eyeshadow formulations. I guess Dior had to add extra flair to their version. God Bless your patience--your end results do look lovely. Then again, you could put mud around our eyes and it would look amazing. Seriously, your eyes have such a gorgeous glow--beautiful! Thank you for your honest review. Despite the patchy results, I will still make it a point to check these out. I would be happy if I could apply it on the lid and just blend the corners if you know what I mean. But once I do this, then it start becoming messy. Hahaha Jane, you cracked me up again! I pictured you smashing an eye shadow tube with hammer in the kitchen hahaha! I actually also find Guerlain one a little strange. The sponge applicator works fine but if you don't want to sheer out, it also starts getting patchy on me. Does that one work on you well? GA ones are much much better but a few of them got me crazy as well. Like Onyx which produces mad fall out that at the end of the day it is all over my face. I know right, even under these conditions, you think to get it, it is such a lovely shade. Then you will be so delighted, there is a lot of Suqqu Fall on the blog during next week! I am super excited for Suqqu collection too, I can hardly wait to show you all. I wanted so much these to be perfect ! Can we find their dupes in nail lacquers? Just for the fun of it? I really love the colors and the combinations that could have been made.After this review I'm afraid that whoever tries to mix them alltogether on an eye look,will seem like Joker! You have cosmic eyes with or without the name of the eyeshadow.well done for your patience! Yes, please check them out. Also maybe other shades perform better. You see these two shades are different. Maybe there is another shade which is much better. I am excited to hear what you think. yes gloss packaging is really so weird. I think the best is to get some at the back of your hand and apply with a liquid eye brush, then it works much better. Cosmic is gorgeous! exactly the same here. I really can't effort the time it takes. I need products which apply themselves lol. The formulas you mentioned here are all wonderful for busy mornings, for a swipe and go! LOL Hara, I know what you mean, I think Chanel Intemporel might be a dupe for Magnetic. For Cosmic, let me check my nail polish stash. Aww, cosmic eye comment, thanks so much :-* You are too nice. These need to be blended with a brush. I'm really interested in Cosmic. I tried everything to blend but it doesn't want to be blended lol. 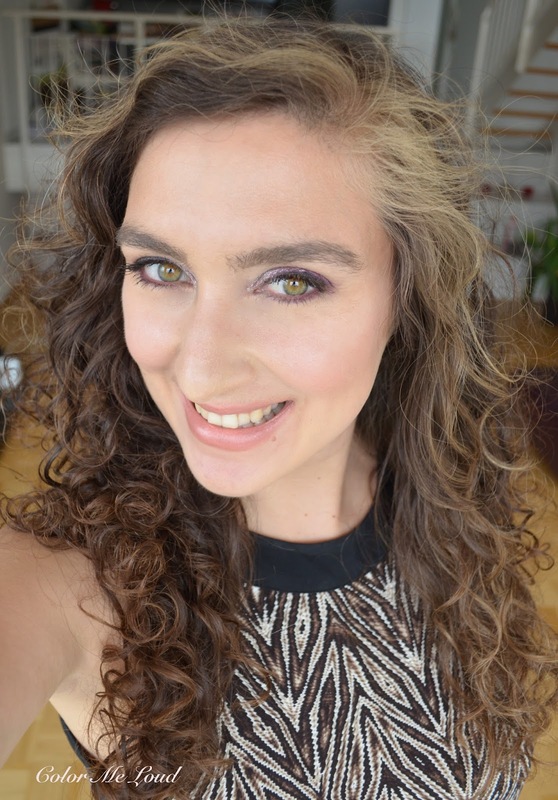 I also tried to use another shade so that it looks blended, you see the first FOTD, there I used MAC Omega. If you find a better way of blending after you purchase it, let me know. I need every bit of tips and tricks with these. yes, these are not easy apply sweep and go and we are busy woman lol. There are many other pretties so money saved. Thanks for the tips. I will get Guerlain one to the holiday with me and try it out like this. I didn't buy it Sunny was so nice and sent me hers. I was super curious, she stopped me from buying it hahah. I had to click on this post to read the full review! What an unusual color and formula to use on the lid! They really do look like nail polishes on your arm swatches. LOL Even though it takes efforts to use, I still applaud the brand for coming out with something new and interesting once in a while. And thank you for always keeping us updated on the new releases! Oh yikes sorry to hear these didn't work out well at all. That brush really looks ridiculous! But that color is so pretty though!! !